This image was taken along the tracks of the Pennsylvania Railroad tracks on the east side of the Portage gorge looking northwest. The tracks, which were built along the old Genesee Valley Canal, can be seen to the right. In the distance, on the far bank is Inspiration Point. The train ran through this part of the Park until the early 60's. You can still follow the old train route on Trail #7. 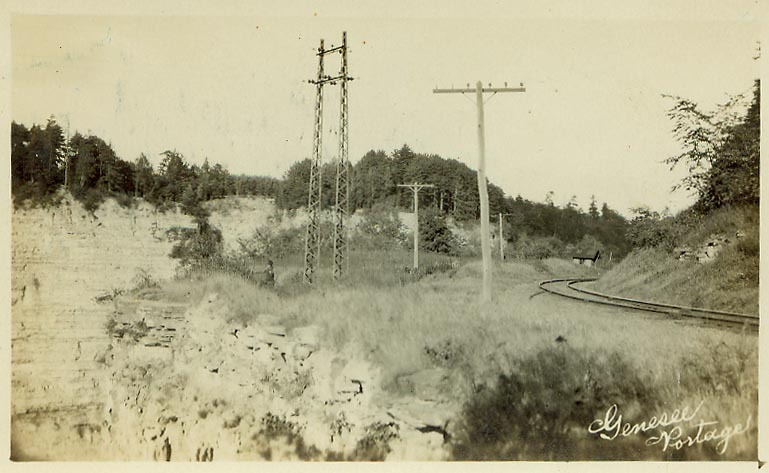 The poles carrying telegraph lines and a small building around the bend of the tracks can be seen. The metal tower is for electric lines which cross the gorge. Although the exact date is not known, the "defender" stamp box on the card indicates a time period between 1920 and 1940.